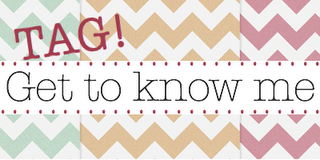 PETITE-SAL: Get to know me tag! Thank you so much, Lexi, for tagging me for the 'Get to know me'-tag! It's a fun way to get to know more about someone. Make sure you visit her blog! 1. Each person must post 11 things about themselves on the blog. 2. Answer the questions the tagger has set for you , as well as, creating your own eleven for the people you will tag. 3. Choose eleven people and link them in your blog. 6. You legitimately have to tag. 1. When I was a little girl, I was left handed. My mom knew how difficult it would be for me in the future, so she turned me right handed. Now I'm right handed, but for some things I still use my left hand. 2. I walk very fast, even though I'm a shorty with short legs. 3. I speak 6 languages: fluent Dutch, English and Berber, a little Arabic, poor Turkish and French. 4. My hair and nails grow really fast. 5. My favourite colours are black, grey, navy and taupe. 6. I'm 1.60m (5'3") and I love my height! I think I'm one of the few people who actually loves to be short. 7. I'm pale, but as soon as the sun shines, I tan verrrrrry quickly. 8. I was born The Netherlands, where I currently live. 9. My favourite breakfast is chicken and rice. 11. I can spend hours watching Discovery Channel and National Geographic. 1. Who's your favorite fictional character? - Vegeta!! He's so stubborn and proud, yet he has a soft heart for his family and loved ones. And I used to have a crush on him when I was little. I still kinda do..
2. What do the keys that are on your keychain open? - Two keys to our apartment; one to open the lobby and one to open the door to the apartment, a key for the mailbox, and two keys which both open a different, stolen bike. 3. Which qualities do you look for in a best friend? - Humor, same way of thinking, understanding, good taste of music. 4. What's your favorite thing to do in your spare time? - Listening to music, daydreaming, blogging. 5. Where is the next place you'd like to travel? 6. Tell us the fragrance/cologne you wear most often. 7. What is something that makes you nervous? - If someone doesn't finish his or her sentence! Just say it already! 8. Are you wearing any jewelry right now? What is it? - I just woke up, so I'm only wearing the ring my grandmother gave me. I promised her to never take it off. 9. Tell us about the time you first used a computer with internet. Where were you, what did you look at, were you excited about it? - Honestly, I can't remember! But what I do remember is when we got our first computer, without internet. I spent nights playing Solitaire. 10. Did/do you have braces? - No, but I'm seriously considering it. 11. What makes a party a GREAT party? - Family, friends and goood foood!! 1. What's your favourite food? 2. Who do you find the most inspiring person? 3. If there's something in your life that you can change, what would it be? 4. How's your relation with your siblings, if you have any? 5. What's your favourite piece of clothing and why? 6. Name three things that you must have done before you die. 8. How often do you have 'no makeup-days'? 10. Which celebrity do you find most annoying? 11. Which series do you watch? I agree, friends family and great food is always a fun time! nice to know these things about you! Ahh thank you so much for tagging me! You're such a doll. thank you for being a sweetheart. Can't believe Vegeta is your favourite character. Like come on, it's gotta be Goku! :P And trust me you don't wanna get braces! I'm getting some soon since I still have baby teeth :( and I've heard it's VERY painful. I knoooow, but eventually it'll be worth all the effort and all the pain. I've heard it's only painful in the beginning. I don't mind. When will you get your braces? Ah thank you! I pick up languages very quick and I find it interesting to learn new things! Hahaha aah do you remember your first e-mailaddress? Usually it's so embarrassing, so I wanna knoooow haha! Thank you for tagging me dear!!! And omg I love vegeta too!!!! He's like my favourite character and my friends used to tease me for liking him. I am so happy to find someone who like the same character as I do YAY!!! I'm happy to read your answers/facts/questions! It's especially cool that you speak so many languages; learning languages is a hobby of mine, I want to get better :) I also consider daydreaming a part time job...so much fun! Wow that's amazing that you can speak 6 languages! I can only speak one! And forgive me for sounding ignorant but I haven't heard of the language Berber until now. Very interesting! I would love to visit the Netherlands one day!